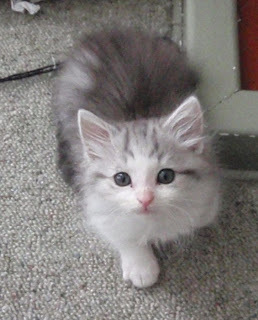 Today I'd like to introduce to the other non-human members of our household. 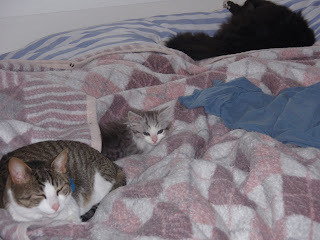 The first photo shows Sam (black and white fluffy male), Rambo (petite tabby male) and Felix (grey and white fluffy male kitten). These three get on reasonably well although the older cats do get a bit fed up with being chased and attacked by Felix. 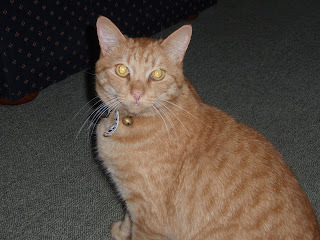 And here is Rascal - he and Felix don't get on. Rascal needs to be reminded to "not eat the kitten" from time to time. And, just because he is real cute, here is another one of Felix. Wow that Felix critter is the most adorable thing I have ever seen. Looks like I will be posting some more cat photos soon - Nom and Rusty will be famous!